This tutorial and pattern makes a 4 inch or slightly smaller version than the orginal in order to use only one frosting sheet. To change up the look, replace Row 6 with varying sizes of pearl or metallic dragees. Water was used to glue the petals together but you may want to try substituting alcohol, piping gel, gum paste glue or a thin layer of RI. Just remember to only use a small amount. 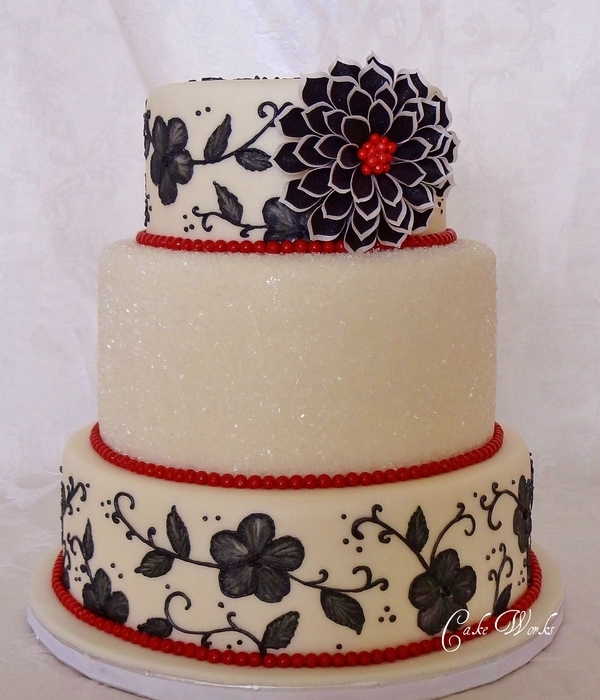 Royal icing was used to fasten the petals to the base to form the flower. 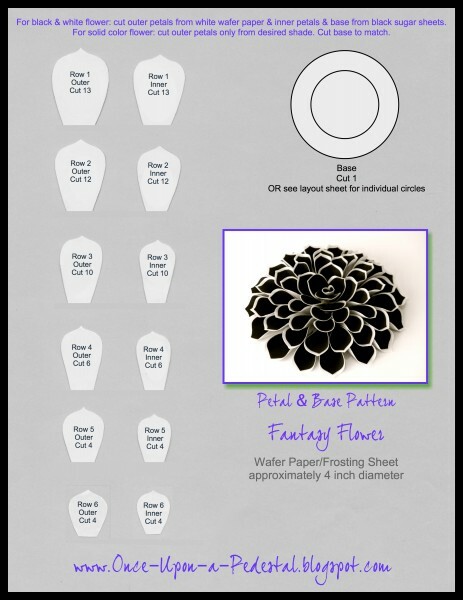 If you haven’t used these materials before, you might want to practice on some scraps to see how moisture, humidity, drying times, amount of water needed to glue petals together, etc. works for you. A more complete tutorial with video clips can be found on my blog. 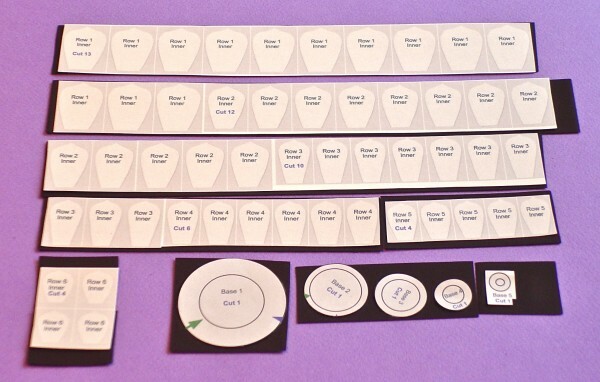 Print template and cut pattern pieces out individually from cardstock. You can be sure you’ve printed the right size if the Base One circle is just under 2″ across. Print layout page on cardstock or paper. (More explanation of this in the blog version.) 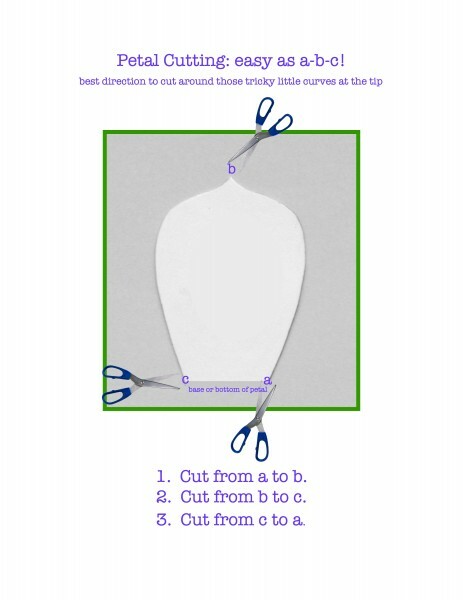 This will be used to cut the desired Base pattern(s) and as a guide to cut strips and then rectangles for sizing the FROSTING SHEET into petal sized pieces for hand cutting with scissors. 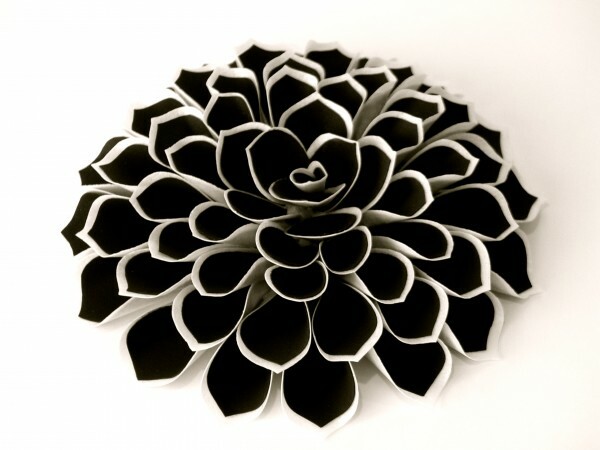 Size the WAFER PAPER into strips roughly the size of the outer petal pattern pieces using a paper cutter or scissors. 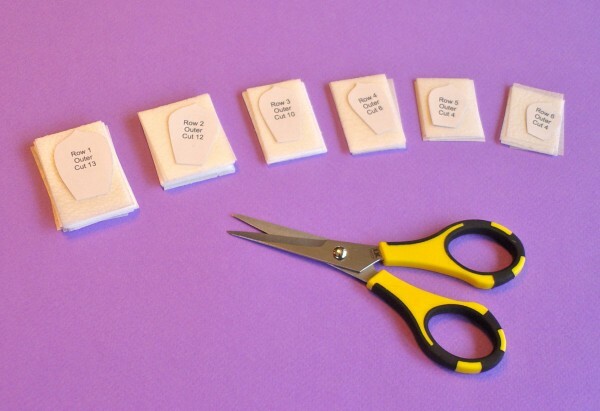 Cut strips into rough rectangles. Stack and cut up to four layers at a time using pattern pieces as guides. Cutting more than four layers at a time may cause the edges to tear or crack rather than producing a nice clean edge. The layout page is for sizing the frosting sheet into strips and shouldn’t be used for pattern pieces, unless you choose to use that Base method. (See blog tutorial with video clips for a more complete explanation.) If you try to take a shortcut and cut through the layout sheet and the frosting sheet at once, you’ll end up with little shreds of paper embedded in the sides of the cut petals. Be sure to use the pattern pieces that you’ve pre-cut from the template instead. When cutting the petals, I found it easiest to start at the lower edge and cut upwards toward the point then down the point on the other side. The third cut is across the base or bottom of the petal. This helps make getting into the tiny curve near the point a bit less difficult. The rough or textured side of wafer paper should be facing up for better folding and less chance of tears. This petal pattern isn’t completely symmetrical so the assembled petal pieces will not look completely even or be perfectly spaced. The goal was to make them not seem TOO perfect or cookie cutter looking. Remove the black sugar sheet from its foil-lined pouch. Remove clear plastic liner from the sugar sheet. Note the under side has a shiny surface. This will be the back or under side of the petal so make sure the dull side is up during cutting. 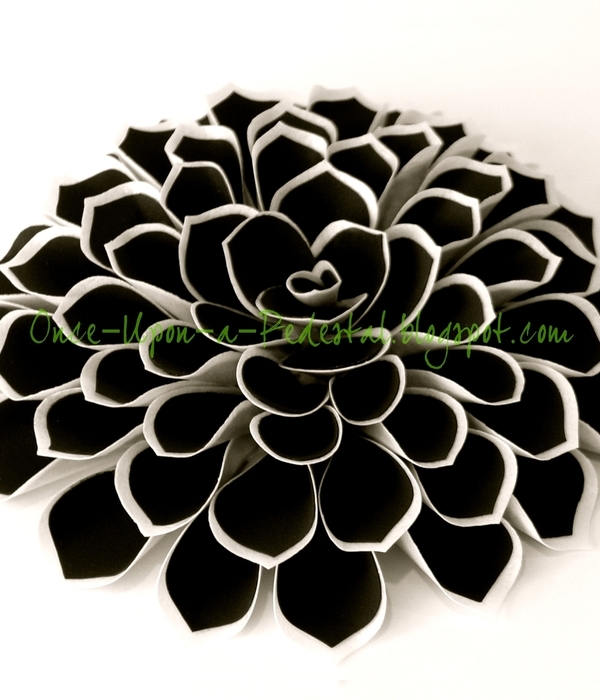 Cut inner petals and Base circles 1 or 1-5 from black sugar sheet one at a time. There is no Base 6. Place cut petals in airtight bag between small rectangles of parchment or waxed paper until ready to assemble. If your frosting sheets dry out, there are some things you can try to rehydrate them. The Cake Central link on page one will take you right to the frosting sheet emergency department. No waiting. The cut frosting sheet or inner petals can also be rehydrated if you find they are not bending as easily as you’d like. They cannot be rehydrated after being attached to the wafer paper petal. If you haven’t worked with either of these materials before, you may want to play with some scraps to get the feel of just how little moisture is needed, what the drying time is in your locale and what happens when either of them get too wet. If the frosting sheet petals get too wet before being attached, just set them aside on foil or a silicone mat to dry for a couple of minutes and they’ll be as good as new. Try to avoid moving the black inner petal around or repositioning it too much after it’s on the wafer paper. The black can transfer quite easily while it’s wet. Having a slightly dampened paper towel to clean your fingertips is handy. 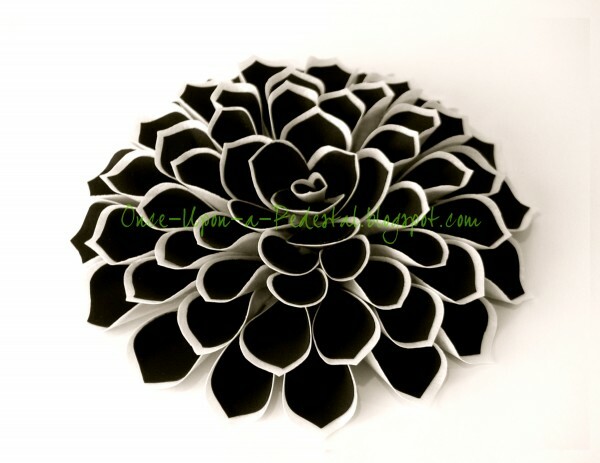 Starting with Row 1 petals: Glue black inner petals to outer wafer paper petals by painting a small amount of water or flavored vodka to the shiny or back side of the black petal and carefully placing on the rough or textured side of the wafer paper. It is not desirable to adhere the entire surface of the inner petal to the outer. 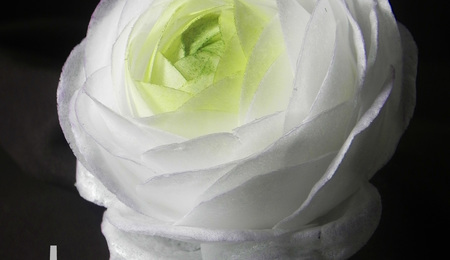 Leaving a dry edge around the upper most part of the petal allows more flexibility during the petal shaping. It also helps insure that the black from the frosting sheet doesn’t rub off on the wafer paper while attaching the two pieces together. What’s important is that the bottom edge and center of each petal be firmly attached, so focus your efforts here. Just make sure that the bottom edge of both pieces align somewhat and that the black inner petal is centered from the sides. Position the petal lengthwise in front of you. Gently fold each side of the petal toward the center while supporting the entire length of the petal to prevent stress cracks until the petal is clamped. Firmly finger press the base only and apply a small amount of water or flavored vodka to the inside the fold. Hold firmly until clamp is applied. Work on one petal at a time rather than trying to do this assembly line style. It’s much easier to shape the petal while it is still damp. Clamp with a mini plastic clothespin until partially dry or set. It’s best to work one row at a time and start applying the petals to the base as soon as you finish assembling all the petals for one row. This way they have a few minutes to set up in the royal icing before you add the next row. More importantly, for all but Row 1, it’s best that the clamped area of the petal is still a little flexible so that you can gently bend it into a soft “L” shape to have a flat contact point with the royal icing/base. Repeat with all petals up to and including Row 4. Drying time will vary depending on humidity but 10-20 minutes or less is about right. Bone dry isn’t needed, just dry enough that the folds aren’t coming apart. If the petal develops a small tear or crack near the base, you can try adding the tiniest amount of moisture and placing an additional clothespin over the area until set. A lot of the petal is covered up by the row on top of it so it’s fairly easy to hide a small mistake. No worries! For Row 5 petals: Use the same method of gluing the petals together as above but instead of folding each side toward the center, gently fold over just edges of the petal to meet each other to create a more open petal. Clamp to dry slightly then assemble Row 5. See the video clips on the blog tutorial version for more detail. Row 6: Glue outer petals to inner petals. Using one of the four assembled petals, gently fold the sides toward the center but overlap like a folded letter or into thirds. Carefully open the top of the petal by fanning slightly. This will be the center of the bud for Row 6. Glue base and clamp to dry slightly. To form the remaining 3 petals, bring the bottom sides together in the center and clamp to dry slightly. 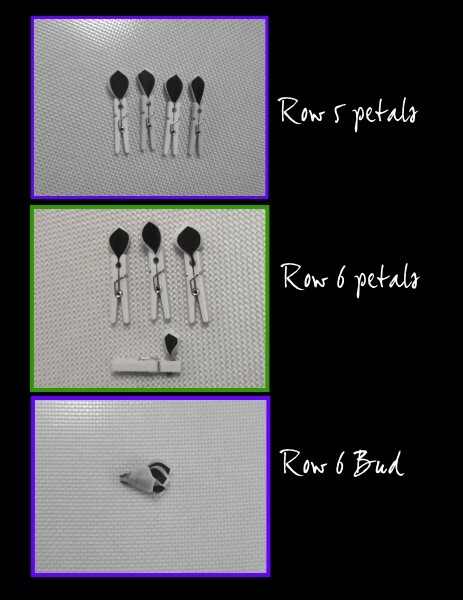 Row 6: Assemble Row 6/Center bud by wrapping 3 petals around the 4th tighter wrapped bud petal. You may have to trim a bit from the bottom of the completed bud in order for it to set down in the flower a little lower than the petals in Row 5. Assembly of Flower: Place the base on a piece of aluminum foil before putting it on the saucer. If you use too much royal icing, the base can dissolve or crumble. Best to be safe so that your flower won’t stick to the plate. Remove clamps from dried petals. Place the Base 1 circle in the center of the small saucer. The saucer will act as a turntable of sorts during assembly. Pipe a ring of royal icing from the edge of the base circle to the first ring. A damp brush is helpful to spread and even out the icing if needed. Starting with Row 1 petals, place the petals side by side around the outside edge of Base 1 with the bottom end of the petal touching the inner ring. The inner rings on each base help make sure that your flower doesn’t end up in an oval shape. 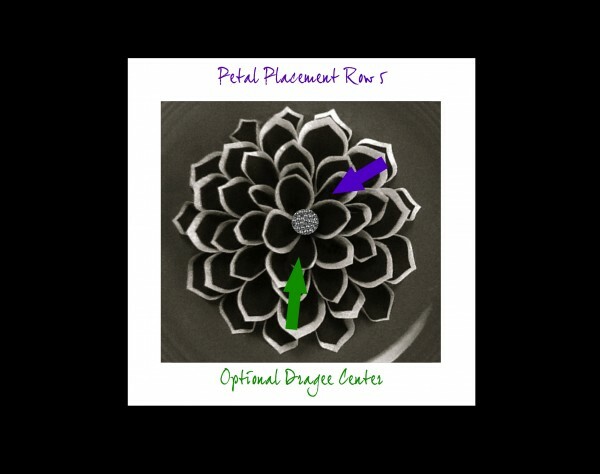 Adjust as needed so that petals are laying flat and are evenly spaced with no overlap. You can assemble the entire flower on top of Base 1 if you’d rather eyeball the circles instead. If desired, insert Base 2 into the flower center and secure with a tiny dap of royal icing. Pipe a ring of royal icing over the ends of petals in Row 1, about ¼ inch up the base. Spread the piping evenly to the inner ring of Base 2. 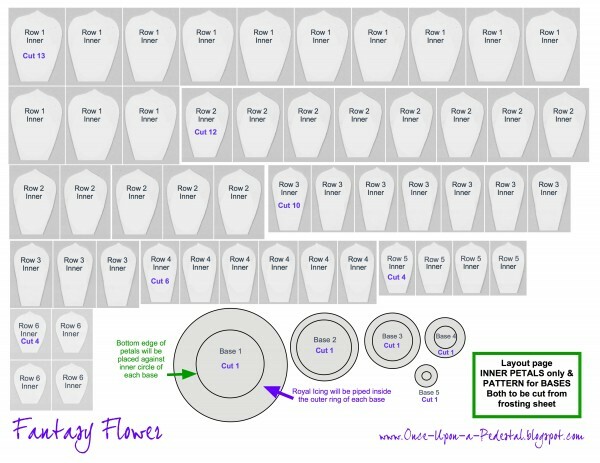 Repeat the placement of petals for Row 2 following the same method. However, center the first petal in the next row over two of the petals in Row 1, so that no gaps between the petals in Row 1 are showing. The petals will naturally start to stand up as you work toward the center of the base due to the height of the petals beneath. Press the very bottom edge of the petal firmly into the royal icing to be sure the surfaces make good contact. 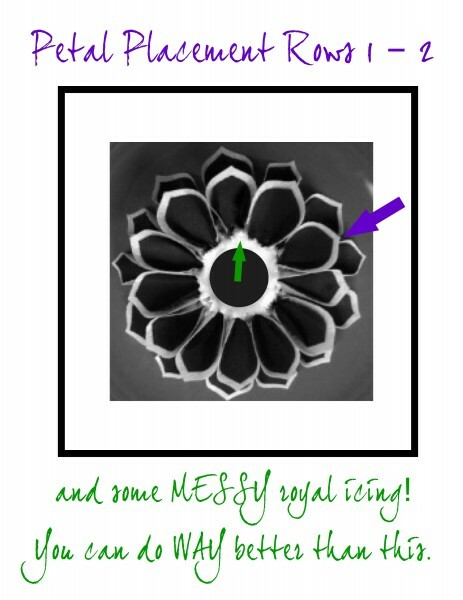 This also causes a bend in the petal stem which helps the petals stack better. Continue this method for Rows 3-4 making sure to offset the petal position of the previous row to cover any gaps. Row 5 petals should be placed so that they are tilted slightly upward. For Row 6/Center bud, pipe a dot of royal icing in the small remaining bare center of the base and position the bud inside. You may need to trim the base of the bud if it is taller than the surrounding row. The center bud should end up being shorter than the rest of the flower so that you are looking down inside of it. Alternative: replace Row 6 with a few dragees glued into place with small dots of royal icing. Be sure to let the royal icing in your finished flower dry completely before handling too much or placing it on a cake, at least overnight. 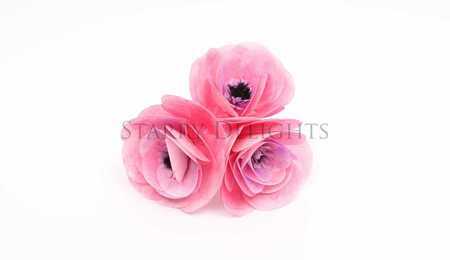 If you don’t plan on assembling your flower right away, store the petals in an airtight bag or container until then. Finished flowers can be stored in the same manner if not being used immediately. I live in a fairly humid climate and have left my completed flowers out and unprotected for weeks with no issues. 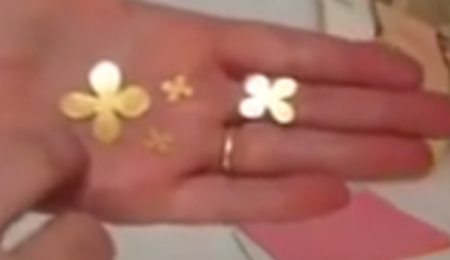 After flower has dried completely, attach it to dried fondant on your cake with royal icing. The moisture from fresh fondant may warp the wafer paper petals so it’s best to wait until the fondant has hardened before attaching your finished flower. You can also prepare a small circle or other shape of fondant in advance and let it dry thoroughly to act as a shield between any damp fondant and your lovely bloom. Please send me a PM or comment on my blog or CC if you have any questions. Thanks for trying them out! 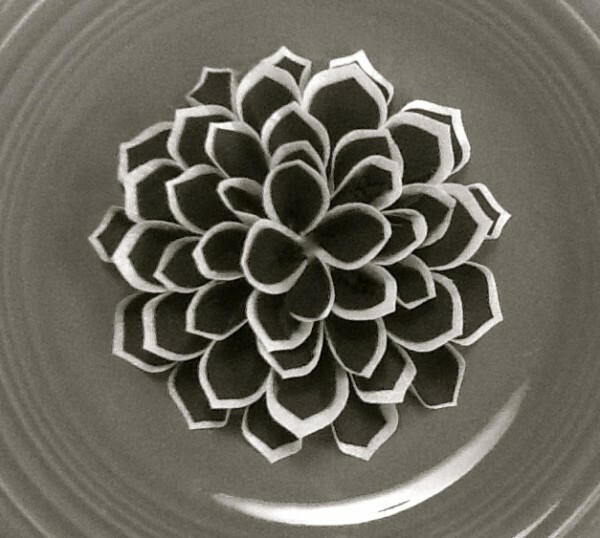 Hand cut 6.5 inch diameter from wafer paper and frosting sheet. 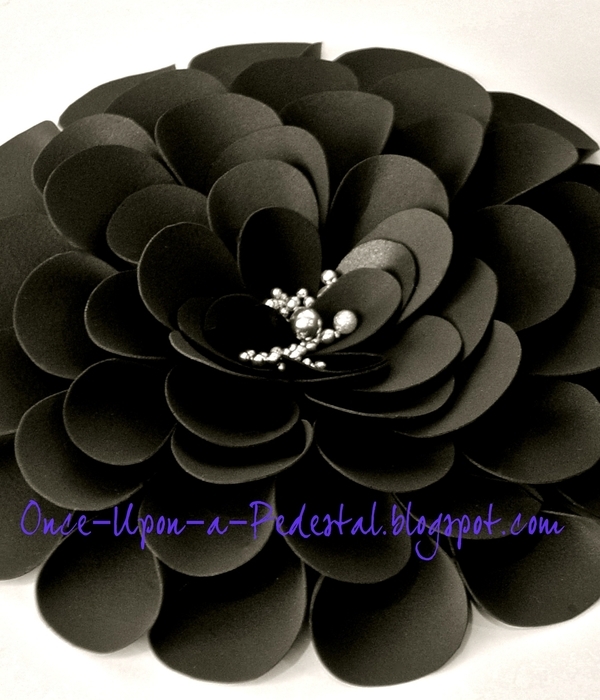 Hand cut 6 inch diameter with silver dragees from black frosting sheet. Can't wait to try this, what a great and thoroughly informative tutorial! Thank you! Forgot to note that while up to 4 layers of wafer paper can be cut at once, only 1 layer of frosting sheet should be cut at a time. Thanks for looking! This looks really fun to do! I am going to have to try this. I have not seen this done. Darthstefeny: I can't think of a substitute but if you search online, there are several places to purchase it. I have at least one on my blog but I'm fairly certain that CC won't allow me to post that here. Michaels doesn't carry it. Yet. Thanks for your kind comments! A fanatstic how to!! your #1 fan! This is the BOMB!!! I can't wait to try it. Just subscribed to your blog. Girl, you are sooooo talented!!! could you just use white wilton sugar sheets instead of the wafer paper? you use the black ones, so why not the white ones? there isn't too much of a difference on thickness or flexibility is there? 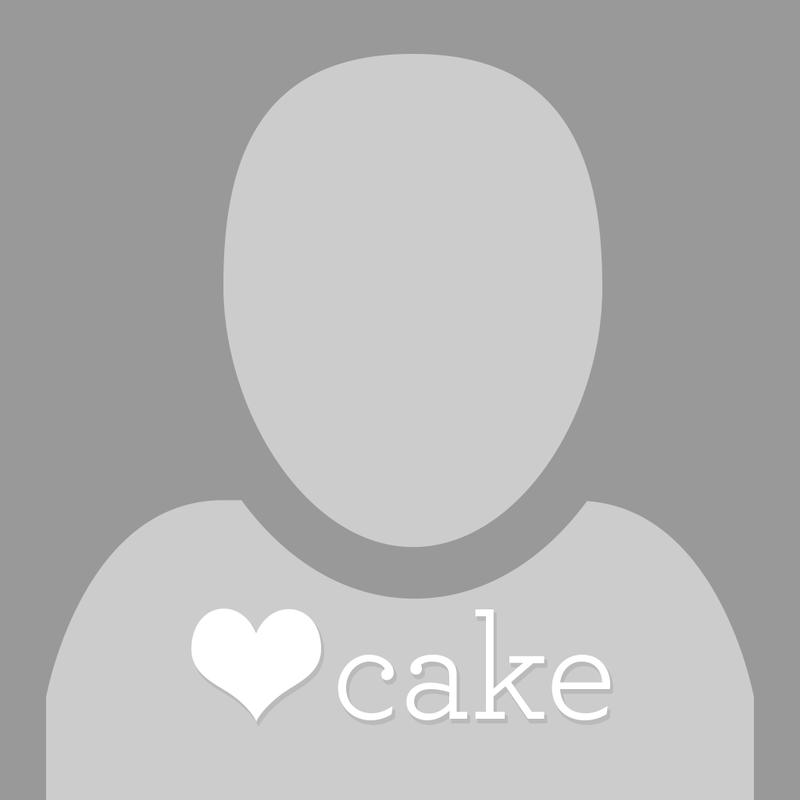 cake-luv: when I tried it the outer layer cracked. For whatever reason, the wafer paper is just flexible enough not to. You may have better luck with it than I however so why not give it a try on just one petal to see? What a great idea and an excellent tutorial. Thank you for sharing! im going to buy the supplies today, cant wait to try it!!!!!!!! There are several grades of wafer paper. Icing Images sells both the icing sheets and the wafer paper that will work wonderfully with this tutorial. Here is an exclusive coupon for Cake Central members good one time for 10% off your total order and we will ship it all right to you!!! Use code "cakecen10" when placing your order! Plus, the lustered icing sheets are less expensive than Michaels!